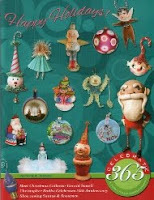 Happy Holidays: Happy Birthday to me! 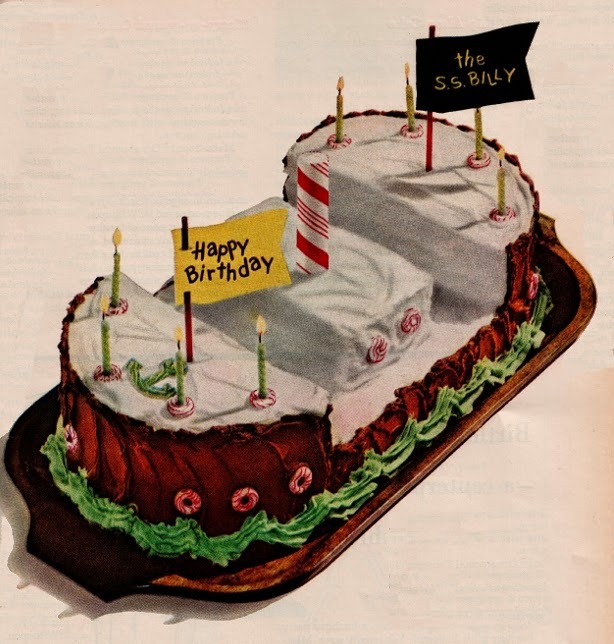 Image from the 1963 edition of "Better Homes and Gardens Birthdays and Family Celebrations". It is my Birthday today! I thought that I would try and find a BIRTHDAY CAKE. I like pink but I don't know about the little dancing girls. This is nice but I'm not to certain... that is an interesting plate that it is resting on though. This is definitely looking promising. 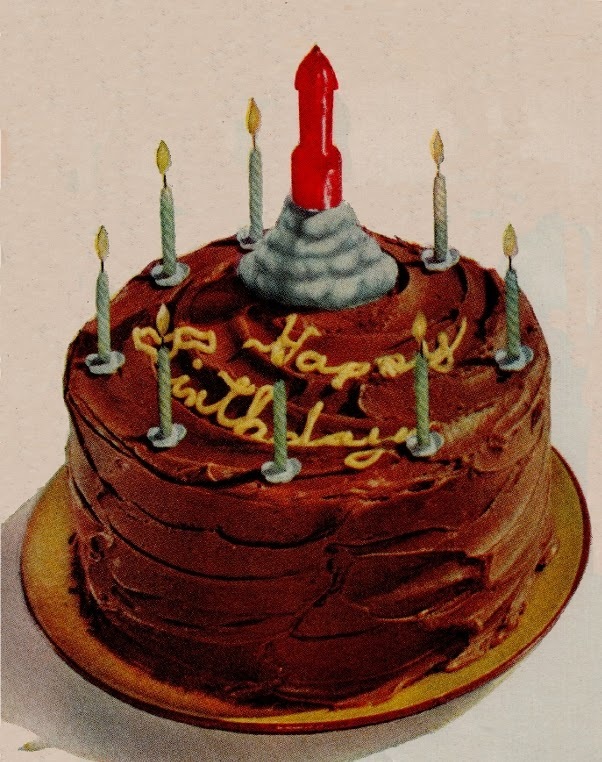 One candle that helps, no one knows how old you are and you can't get winded trying to blow the candles out. Chocolate is always an excellent choice. One candle again, that is a plus. 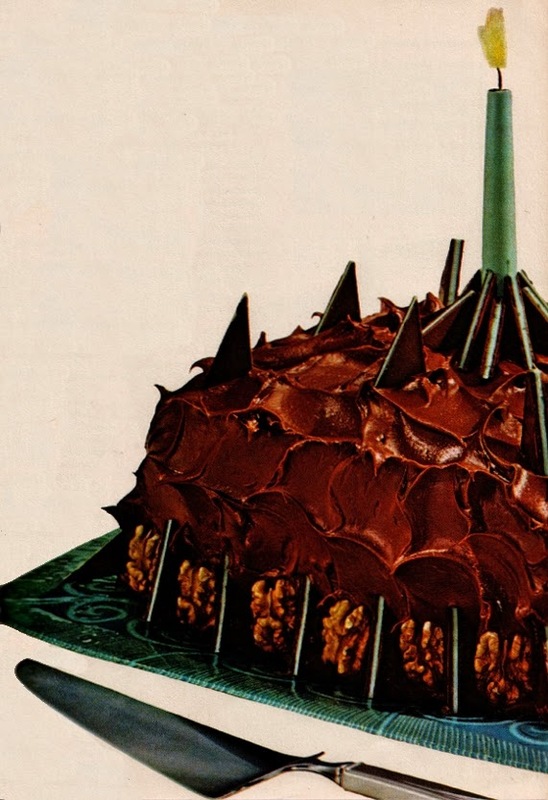 This cake looks like a lot of fun. We could hang Chinese lanterns. 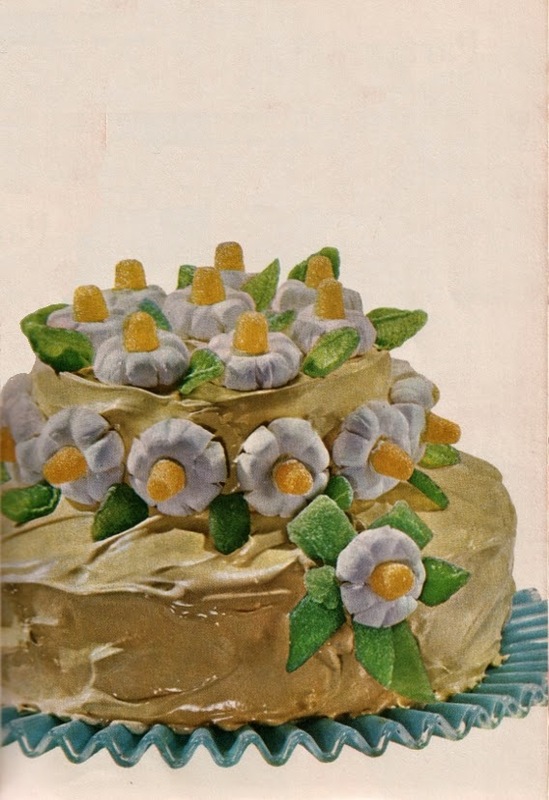 Image from the 1959 edition of "Better Homes and Gardens Holiday Cook Book". 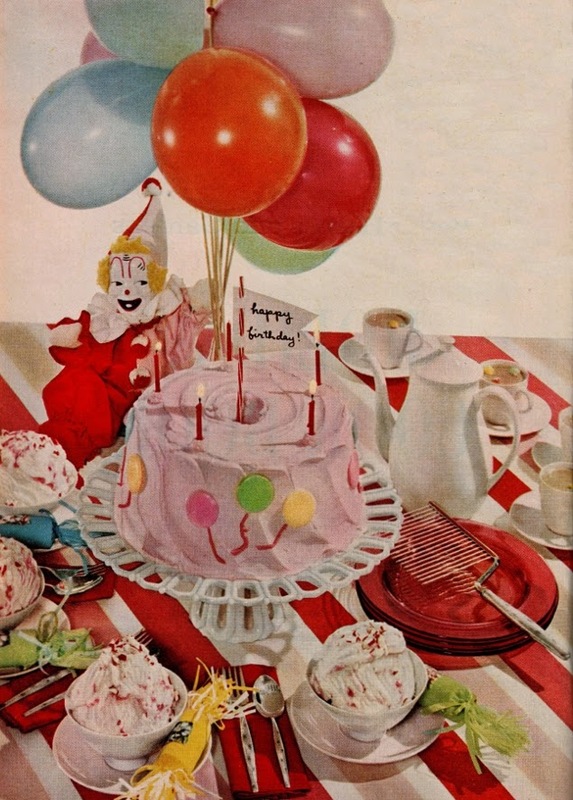 A circus merry-go-round with three different kinds of icing on top. That would mean three pieces of cake. I'd better not. I like chocolate, we'll see. Oh, and it has a rocket ship! The S.S. Billy will have to be the S.S. Lenny. I don't know peppermint is not my favourite, but I will eat it. I could have two cakes, not for me but to share. Some people have peanut allergies! We could have parfaits instead or maybe to go with the cake. 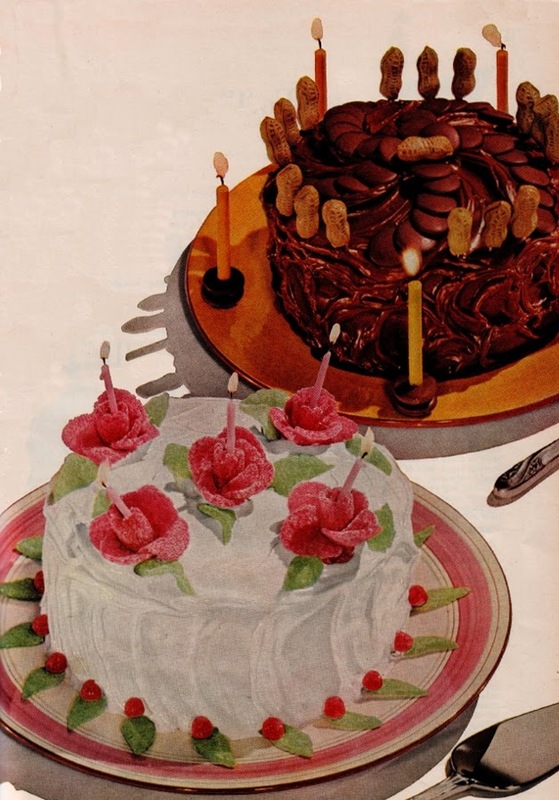 We could have a Birthday Sunday or a Birthday Sunday and cake. There are too many possibilities. 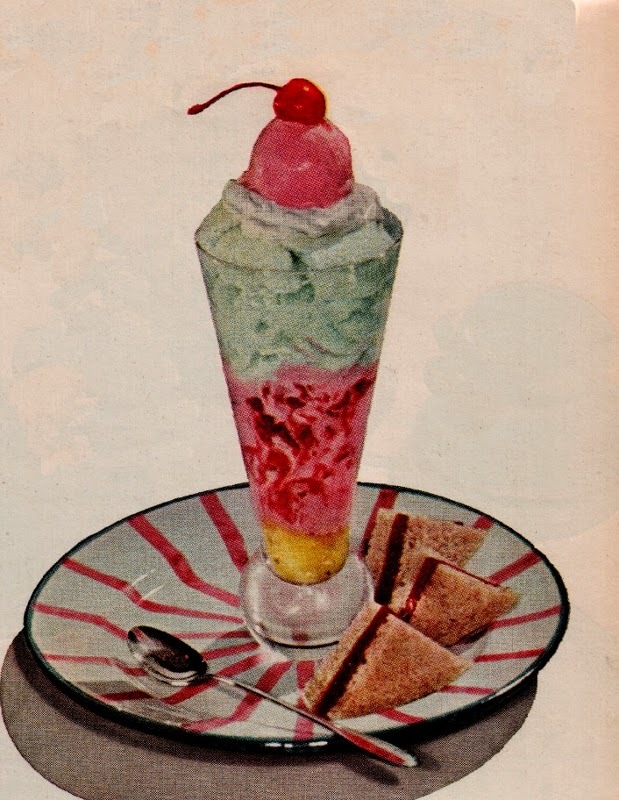 An ice cream cake and floats and iced tea, no it is too cold here today. 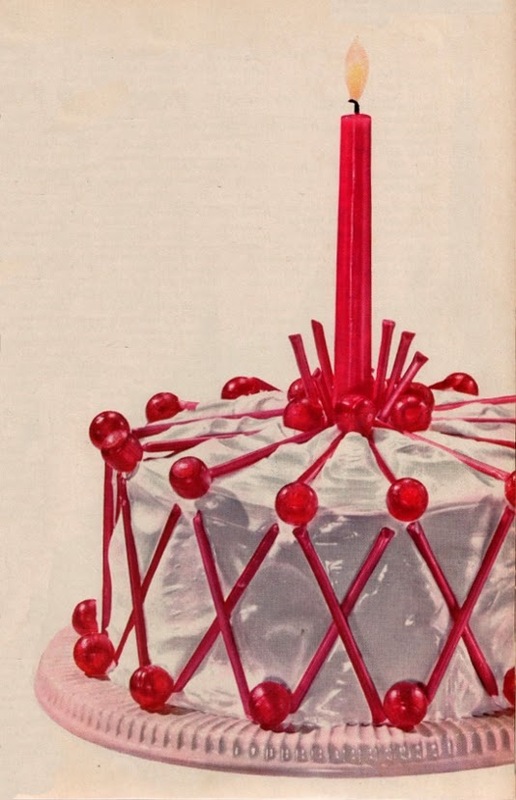 Image from the 1959 edition of "Better Homes and Gardens Holiday Cook Book"
This looks like a fun table. We could have a CIRCUS PARTY! This would be so much fun. 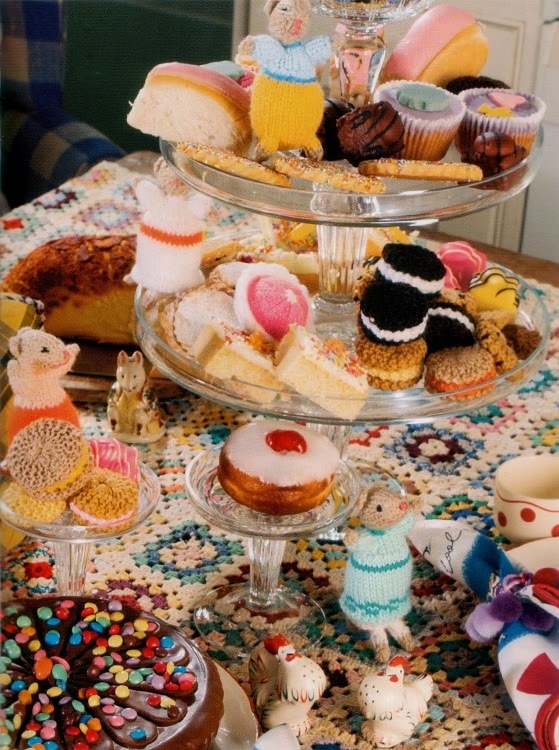 The table is groaning with goodies but a lot of the food is knitted! A lovely tiered cake stand filled with goodies. 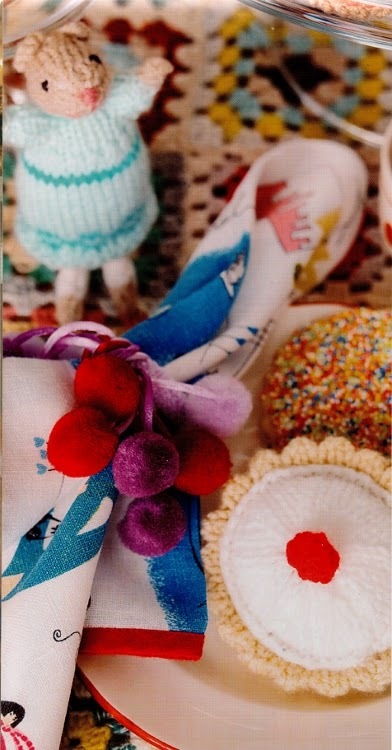 Tiny knitted toys and pompom napkin rings. I like it but would everyone else? Unfortunately the Licorice Allsorts aren't real. It does save calories, but it is my Birthday. I'm in a quandary I don't think I have come any closer to deciding. 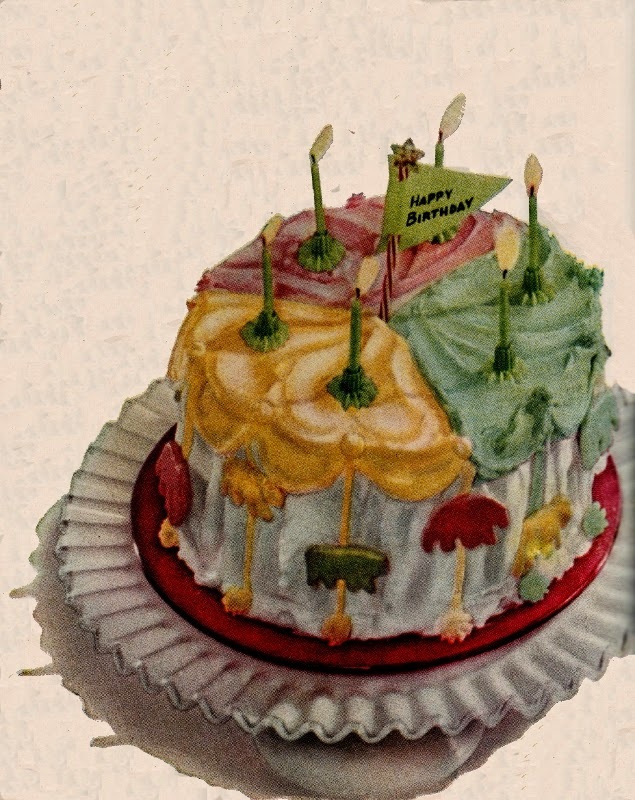 Well it looks like Lori Rudolph of RetroRudolphs and Amelia Schaeffer of Sweet B Folk Art are celebrating my birthday today. 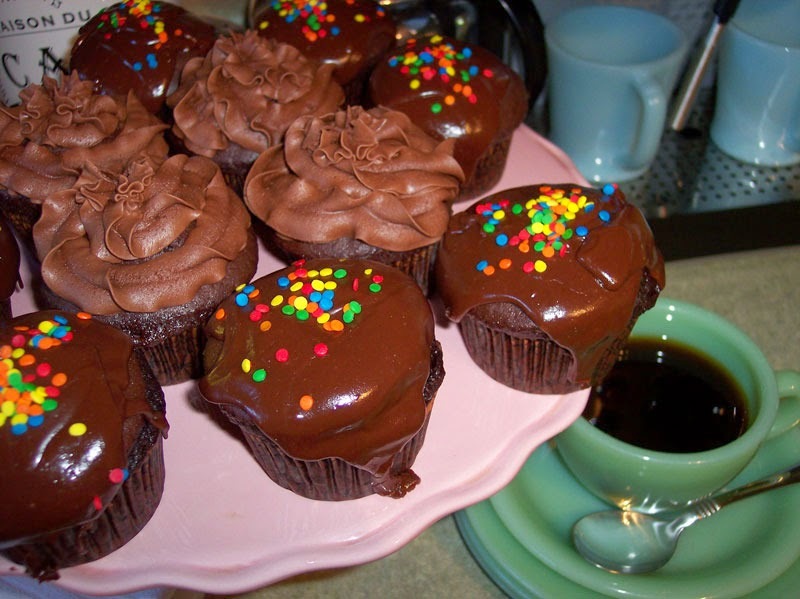 Lori Rudolph of RetroRudolphs baked me some cupcakes - yes Lori I stole this image from your blog! But alas I won't get a chance to taste them. Go to her blog to see her cupcake making, it's just like being there but without the tasting! 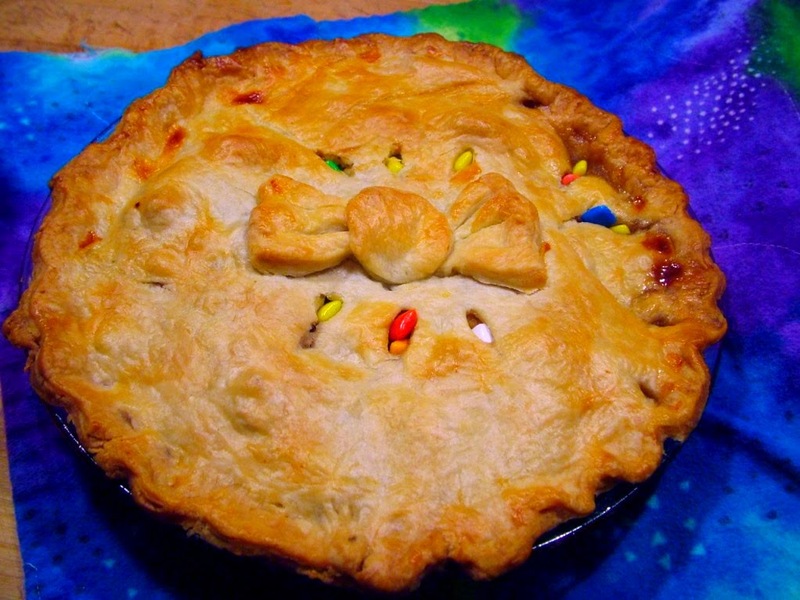 Amelia Schaeffer of Sweet B Folk Art baked me a lovely pie. This image was stolen from your blog as well! No tastes here either. Go to her blog to see her step by step pie making. Happy Birthday Len and many more! Thanks. 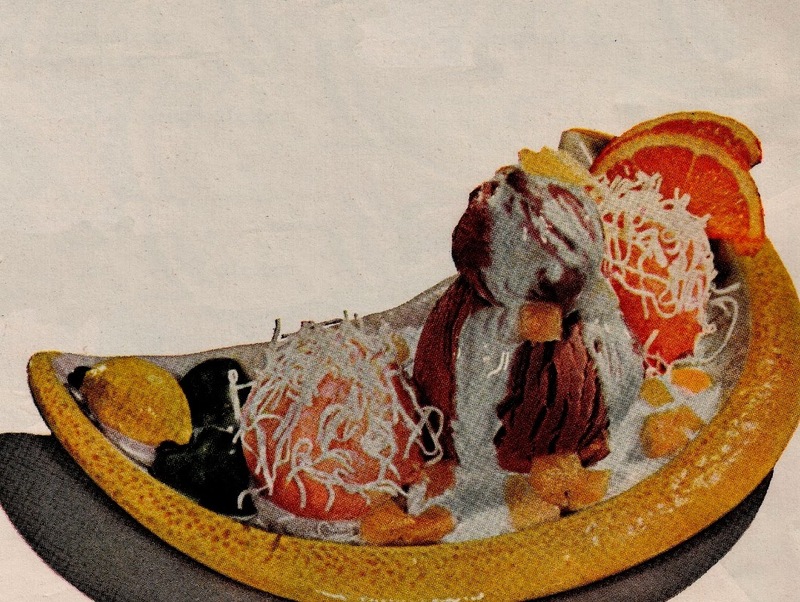 I think I still like that party with the fake food. 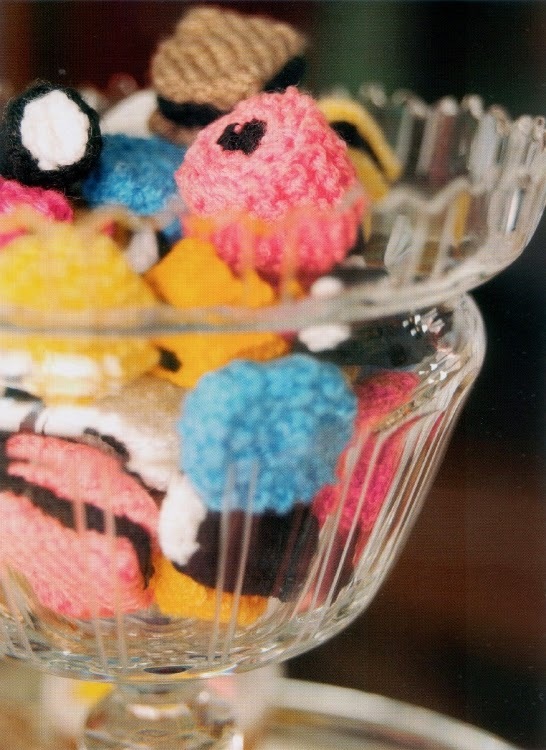 I am partial to both the merry-go-round and the faux licorice allsorts... I will however eat a cupcake in your honour! hope you had a lovely birthday len! 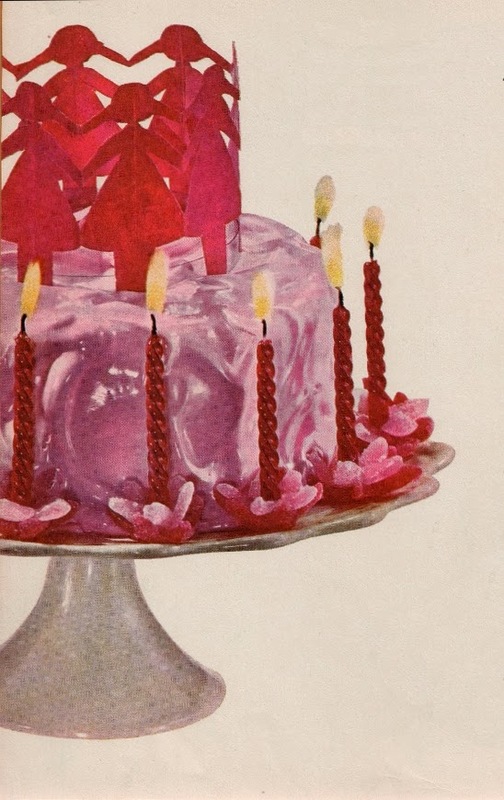 great cake pics - love the chinese lanterns one. Did the cupcake taste good Lori? Thanks Sammy and Glenn I had a wonderful Birthday yesterday. 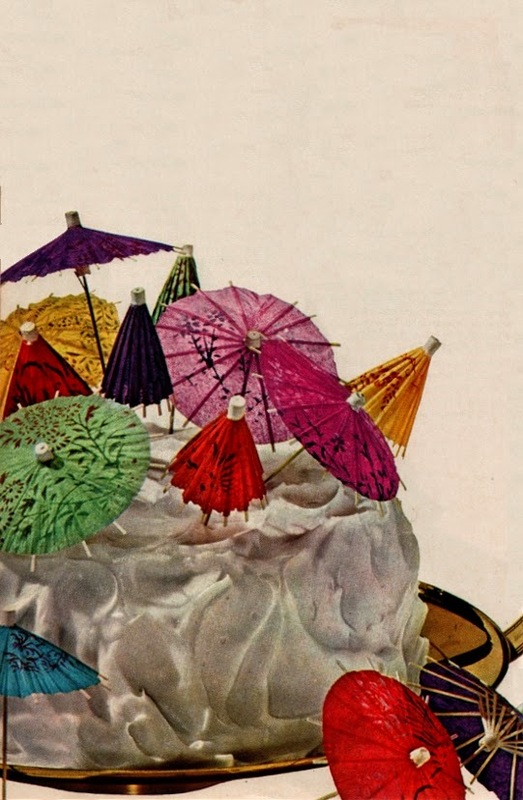 The paper parasols cake is one of my favourites as well. 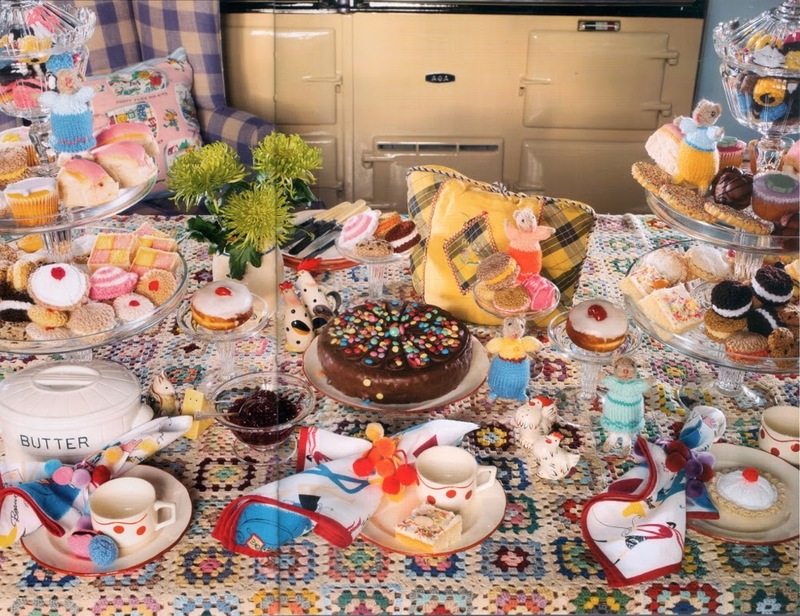 I do like the images of the English party with the knitted food. thanks for the invite and neat cakes.. what to pick? ?like the knitted stuff fun to play with after eating!